We also added a couple of new team members! Lyndon joins our customer success team and Sam has come on board as our new ops manager. We’re still hiring for other positions as well so as always, if you know any awesome people who want to work with an ambitious remote team that’s making sales faster and more efficient for small businesses – send em our way!  Order the columns how you want them. Now you can put the most important columns first!  Resize column widths, now you can shrink or expand columns to fit the data in them. Between price (or number) filtering! Want to see all contacts interested in a place between 100,000 and 500,000? There are now date ranges as well, like show me all contacts that were created last month. The contact name will always be on the screen. There is now an area to see all filters in one spot for any list. This will help you to understand what the list is doing. 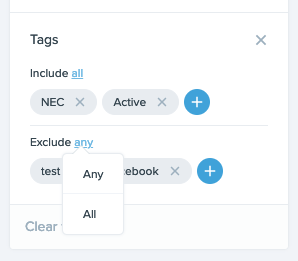 Your sort options are now more clearly stated in the column header dropdown. You can now add filters and hide columns right from the column header itself. When you scroll we now remove the main FUB header and list menu. This helps to give you more room to focus on the contact list. 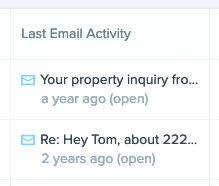 In the new people screen, we change ‘Last Email Open’ to ‘Last Email Activity’ and we also now include the subject if exists. In the new People screen, you can now filter contacts by “Any” or “All” of the selected tags! 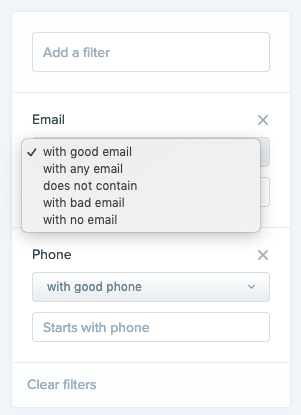 In the new People screen, we added the ability to filter by good or bad phone/emails. Also we have brought in email ‘does not contain’ filter which was available in the old People screen as well. 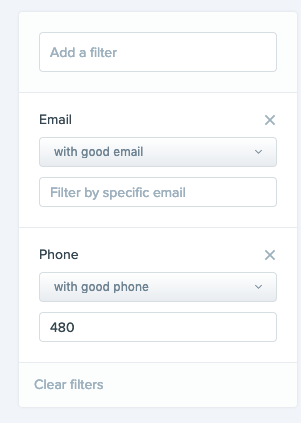 When you add the filter, it’ll start with a ‘good [phone/email]’ filter, you can always go to any, but figure most people are wanting good phone’s and emails. In the latest update (v2.5.0), we’ve made our collection of help articles available in the Android app. Additionally you can now submit app feedback and request help from the Help Center as well. For information the new way of providing feedback from the app, see this help article. Additionally, we’ve removed the “shake to report bug” screen from the app (pictured below), as this caused some confusion and some users thought that this was for adding call notes after a call rather than for reporting a bug. For reference, see this article on How to Log Calls on Android. We’ve added an option for sending text messages via your preferred messaging app. 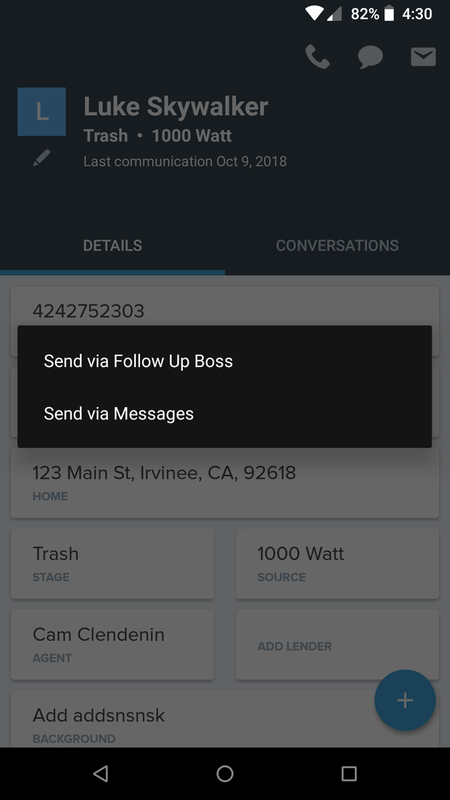 When starting a text message conversation from the lead detail screen, users will now see the option to send via Messages. Users who wish to send a text message via their personal phone number can now choose this option. Also in this release, we’ve fixed an issue causing some confusion around claiming leads in the Android app. The confusion was caused by the absence of messaging to inform users when a lead has already been claimed. In the past, when attempting to claim a lead, if that lead was already claimed by another team member, there was often no visual indication of this fact – now there is. We’ve released a change to the way we capture address fields from lead emails so that we can better handle addresses that are unreliably formatted or missing data. This should translate to more correct inquiry address merge fields in action plans and templates. In the new People Screen, we have moved the Filter button out of the button group, this should help make it more obvious that the filter box works different than a dropdown. 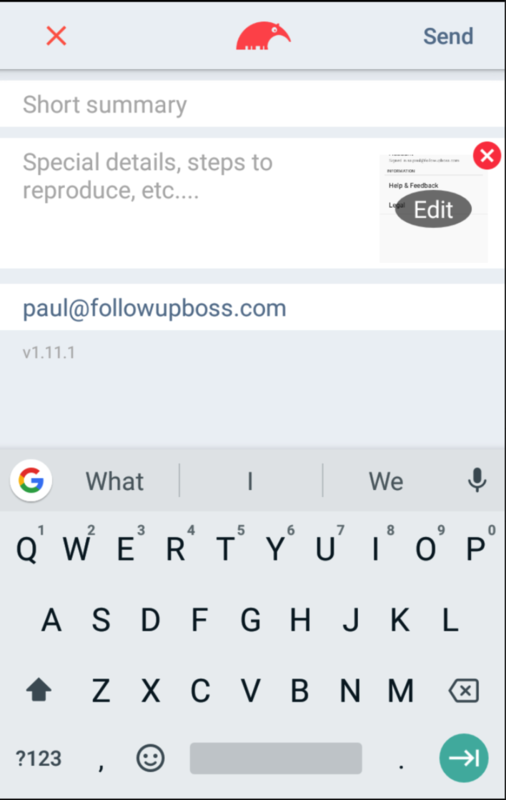 We’ve added 5 new action plans, 6 new text message templates, and 13 new email templates to every Follow Up Boss account. You can find these in the Action Plans section of your account as well. If you’re using our calling add-on feature, we now suppress calls to our desktop app if you’re already on a call. Previously, if you had multiple tabs of Follow Up Boss open and an incoming call came in while you were already on a call we would ring your other tabs. We’ve released a small update to the Android app (v2.4.3) with some stability improvements for periodic crashes that some users experienced over the past few weeks. Address is now on two lines, thanks for the feedback! Added some more prominent highlighting to the dropdowns. One for arrow navigation and one for cursor hover. We will memorize the input values, so if you switch away it’ll go back to how you had it. 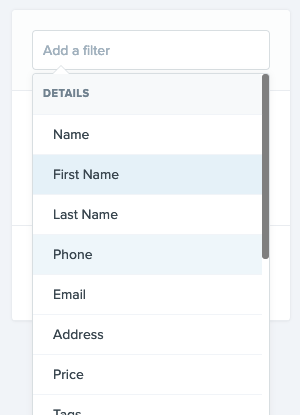 Custom Dropdown Fields filter for “with no [field]” is now in the Include section. 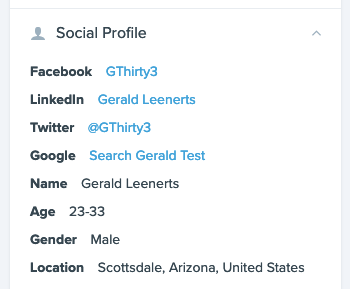 We have updated the link verbiage for social profiles. Instead of ‘view profile’, we will now show the facebook/twitter handle. Additionally, we added an option for searching google. If you are using our BombBomb integration, when sending emails we now correctly use the links that include tracking abilities that BombBomb provides. For more information on this integration please see our help article. We’ve released a fix for a situation that could cause the dotloop integration page to not load. Customers affected by this can go back to the page and reconnect their dotloop accounts to Follow Up Boss. If no columns were defined and you adjust the columns, you’d see the default columns be removed. This should now be more fluid. We’ve fixed an issue that could cause the app to crash when replying to emails in certain situations. This issue only impacted a small set of users running versions 2.3 and 2.4 of the android app.